You are currently browsing the category archive for the ‘American Politics’ category. I did not think the DPP would gain control of the legislature from the KMT, but I also did not believe they would lose this badly. The KMT won 82 out of 113 seats. Ouch! Before the KMT just had a slight majority, enough to create deadlock. It seems this was a referendum on Chen Shuibien’s administration. 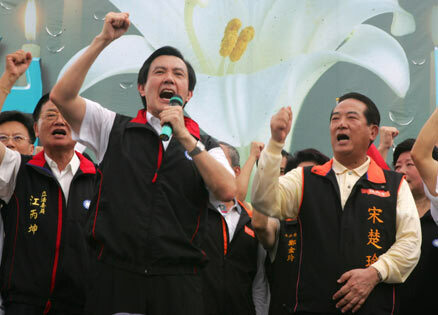 If Ma wins the presidency and completes KMT dominance, a lot of things will change in Taiwan. The 8 year deadlock has caused significant social stagnation on the island. I’m sure China will be pleased with this. The KMT are not ready to rejoin China, but they will not make any provocative moves either. This takes pressure off of American and Japan. Closer economic ties with the Mainland would likely help to jump start the economy; right now Taiwanese business is handicapped, which is a primary reason that business is firmly behind the KMT. I repeatedly noticed during the campaign that the KMT has calmed down some of their “pro-mainland” rhetoric. It seems that multi-party democracy has led the Taiwanese government to reflect the pragmatic mood of the public. This is a good thing. I do not interpret this as a push by Taiwanese people (Benshengren and Waishengren) toward a pro-China position, but more of a pulling back of the more extreme rhetoric from Chen Shuibien in recent years; economic sluggishness; and corruption in the DPP (who originally ran on anti-corruption). The campaign rhetoric in both the Pan-Blue and Pan-Green camps has been to moderate their positions to the center. A good example of this is the fact Ma did not oppose the UN Referendum. He just opposed “how it was being handled”. My understanding was he wanted Taiwan to try to join the UN under the Republican of China (or maybe China Taipei); whereas he feared Chen wanted to do it as “Taiwan”, which would indicate “political separation” from the mainland. As I have said many times, I am not pro-reunification or pro-independence. I’m pro-democracy. If this is what the people want then so be it. Election fraud allegations are already starting to fly over at Michael Turton’s. There is no word yet from the anti-DPP China Desk, but keep posted. Will Ma be Taiwan’s next president? It looks very likely. TAIPEI: Taiwan’s opposition Nationalist Party won a landslide victory in legislative elections Saturday, dealing a humiliating blow to the government’s hardline China policies two months before the presidential election. This is a great editorial by a former Japanese ambassador, even if I do not fully agree with it. I blogged about this phenomenon before, but in Europe. This is what I was afraid of. Fukuda is soft at a time when Japan needs another “lion”, like Koizumi. I think if Fukuda wants Japan to stay relevant, they need to normalize and change their constitution so that they can have a offensively capable military. 60 years of self-castration is long enough. Japan needs to assume a larger security role in the region, NOW, but not because Washington wants that, but for Japan’s future. If Japan wants a seat on the UN Security Council, if htey want to stay relative in regard to China and not fall under the “Greater China Umbrella” in the future, now is an opportune time to get started in becoming a real world power. In this way I disagree with the author. The author seems to feel that Japan will be isolated as China nad America move closer together. My take is that China will become America’s focus and Japan will be left adrift, much more vulnerable to the will of China. I do not believe Japan should rely on America, but to become as much as an equal partner as possible to America and as a result a key player in the region that America can not afford to ignore and that China can not bully. One of the problems is that Japan is has a very weak prime ministership, that relies so heavily on consensus, due to culture, it is often very slow to move, especially in ways that might be more controversial. In these types of situations, you need a strong leader dynamic, not a council of elders. Japan’s domestic politics has been left in disarray because of the ruling Liberal Democratic Party’s humiliating defeat in July’s House of Councillors election followed by the abrupt resignation in September of Shinzo Abe as prime minister. What effect are these developments having on the vitally significant relationship between Japan and the United States? One important trend is the decline of U.S. interest in Japan.